This Thanksgiving weekend kicked off a long season packed with holiday gatherings with your nearest and dearest family and friends. While this can mean lots of celebrating, let’s face it and be real for a moment: it can also kick off some challenging conversations about your career and professional goals that can make you feel like you’re under the microscope – or leave you unsure of how to explain your career goals, your passions and your purpose to your well-meaning tribe. Believe me, I’ve been there. The first few years of my entrepreneurial life I was an unhappy participant in many a conversation that featured questions like, What exactly are you doing again?, Are you sure this is worth your time, energy and the risk?, and Why don’t you just quit and go get an MBA. I get it. But there is nothing to be gained by hiding your authentic self and journey from those who love you the most, even though they can be the hardest ones to open up to. If you’re ready to talk about the dreams that are stirring something deep inside of you and beckoning you to pursue them (on the side or full time) or you’re already chasing them but haven’t had “the talk” yet, you’re in luck! I’ve created a Fill-in-the-Blank Conversation Guide that will guide you through them like a digital hand holding onto yours as you put yourself and your goals out there. I know it’s not the easiest conversation to have (doesn’t it feel like getting naked in some ways? ), but oh how powerful it is! Sharing what’s going on in your life, your head, and your heart gives others permission to share and take stock of what is going in their own, which creates a powerful ripple effect we all benefit from! Customize the conversation to your own needs and go for it! Hey [Mom/Dad/Friend/Relative]: There’s something that [I’ve been investing more and more time into/interests me/occupies my mind/calls to me] for [years/months] that I’ve decided to [explore/ pursue full-time/invest more time into/take a chance on/commit to on a deeper level]. Starting the conversation is always the hardest part because we build up the drama in our minds and psych ourselves out. I used to do this “telenovela style”, and would visualize the entire thing in the worst possible way. Don’t do this. Do not save the drama for your momma. Don’t even overthink it, just use this simple opener. Each of you is on your own path so I’ve created options for you in this opener. 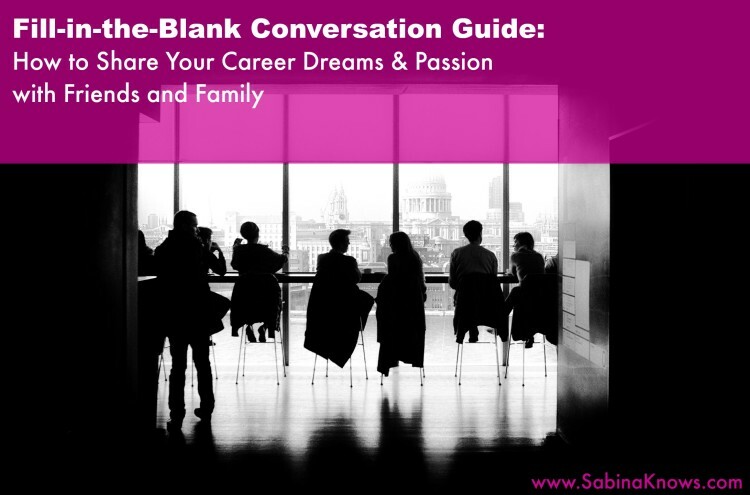 I encourage you to print this guide out, circle the parts of the conversation that are a good fit for you and take a moment to realize how simple it is to ease into this dialogue about your dreams. Yup, just say it. Don’t talk around it, don’t feel like it’s too big or too small to share, just say it. Say exactly what it is that you want to pursue, whether it be salsa dancing or starting your own business. Don’t over explain, negate it or make excuses, just use the exact words you use to describe it to yourself when fantasizing about it or living it. The moment you do – no matter the reaction – it’s going to feel so good, like a big exhale after holding your breath for too long. As John Mayer says, “Say what you need to say.” Honestly and authentically tell them “the why” – why you’re hooked on said dream, goal or passion. Why you’re going to – or already are – making it a big part of your life. You may feel silly or nervous when you begin, but as you talk about it and channel the energy and reasons you are making time in your life to do more of what you love, you’ll also begin to feel energized and empowered, the passion you feel will beam out of you, and trust me, they’ll feel it. And if they don’t, so be it, you’ll still be sharing the “why” that is stirring your soul, and that’s some powerful stuff! Here’s what I’m doing about it: [Starting my own business/Taking a class/Coaching clients on the weekends/Spending my weekends pursuing it/Going public with it…] *Try to keep this to one clear, direct sentence. This may be something you’re already doing or something that you’re going to start doing come next month, in 2016 or tomorrow. The point of this part of this part of the conversation is, you’re showing how committed to this dream or goal you are by telling them exactly what you’re doing to pursue it in a tangible way. This is not a plea for financial support, it’s time for something even bigger that benefits both parties…This is where you give them what they want: To be a part of your journey, to help and support you, to feel like they’re connected to you and what you’re up to, and to have you guide them as to how they can do that in the best way for both of you. You’ll probably customize this part of the conversation depending on who you’re talking about and sure, there may be a person or two you’ll skip this part of the conversation with, but most of those you love will want to be involved in your adventure, and this let’s you share just how they can join you on your journey. You want your conversation to end on a high note, right? Well this is how you do it: By opening the door to them to share the things that are exciting/intriguing/calling to them in their own lives. They may not be ready to talk about it now, they may not even know what that is yet, but we’re all human, and we all have big and small dreams that we tend to keep secretly locked up in our heads and hearts. When you put yourself out there and share what is calling to you in your own life, you make it easier for others to do the same. How do you share your professional dreams and goals with your friends and family? Any success stories? Share them in the comment below!